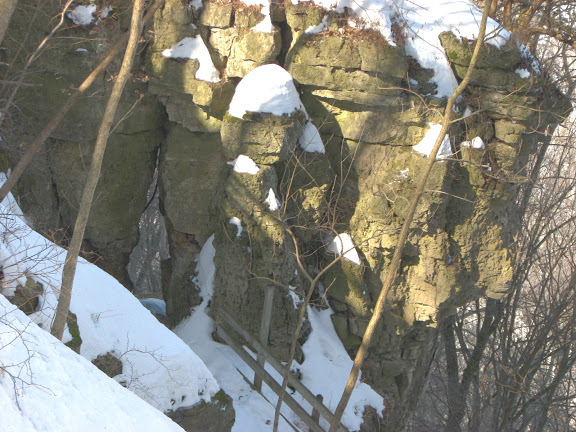 The Prairie du Chien area was chosen by the Wisconsin Archaeological Society as the place for its 1911 state landmarks assembly. 25 prominent Wisconsin Archaeology Society members, met in Prairie du Chien in late September. 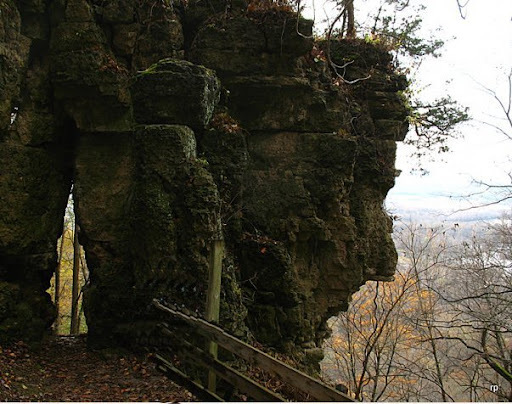 "The purpose of the meeting was: (1) To create a state-wide interest in the need of preservation and educational value of the archaeological and historical remains raid sites of Prairie du Chien, and of other southwestern Wisconsin localities. 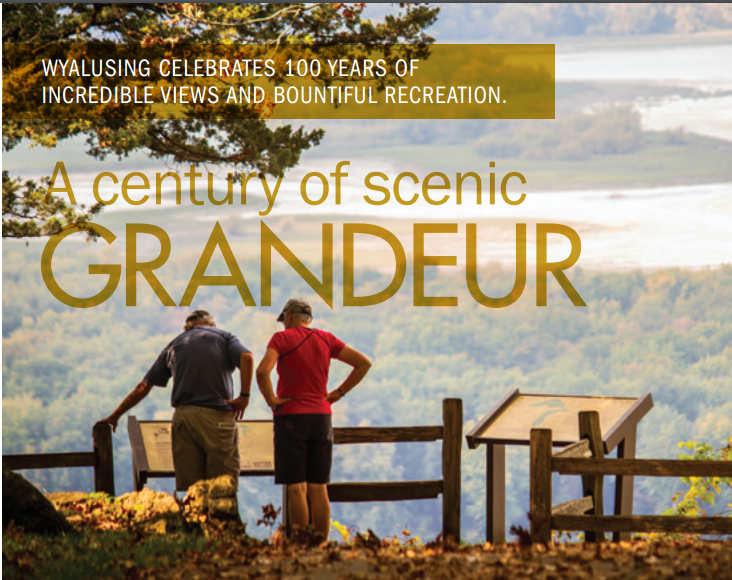 (2) To make known the deep interest of the Society and of its co-working organizations in the proposed Mississippi-Wisconsin River state park, of which it has been for several years an advocate. (1)"
Part of the Assembly tour included a steam boat ride from Prairie du Chien, to Wyalusing, WI. 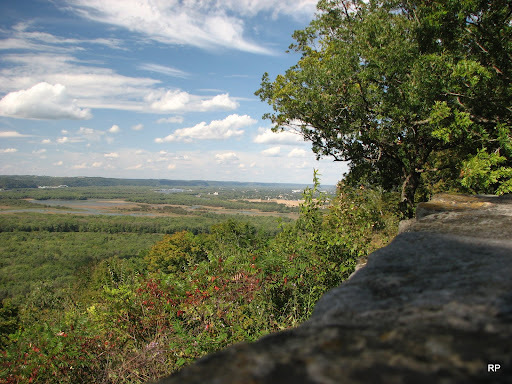 "From the point where the waters of the Wisconsin mingle with those of the Mississippi southward to where nestles the quiet little hamlet of Wyalusing, the three most prominent points along the bluffs on the proposed state park lands have come to be known as Point Lookout, Signal Hill and Sentinel Hill. More appropriate names for these promontories it would be difficult to select. In the river at their base are numerous tree and shrub overgrown islands, some of them containing small lakes, and separated from the mainland by river sloughs. Crossing to the Wisconsin shore at a point a short distance above Wyalusing the Eclipse slowly worked its way for about a quarter of a mile up one of the largest of these river sloughs where a landing was effected, and the entire company of visitors disembarked on the shore at the base of the bluffs. Soon several hundred enthusiastic excursionists were engaged in ascending the rocky tongue of Signal Hill. The climb was a hard one but all were soon assembled on its crest. At this place the bluff is said to be five hundred feet above the river below. The view up and down the river and across to the Iowa shore is magnificent. Here on the narrow crest is located one of the fine groups of mounds for which the state park lands are famous. (1)"
A brief ceremony was held The daughter of Robert Glenn read a short message from a plaque presented to the assembly. (See Photo, left. It is believed that this photo was taken across the top of the large Indian mound next to the present day Pigeon monument.) "The tablet unveiled on the mound on Signal Hill during the Assembly is to be mounted on the face of a large boulder thus preventing its removal from the mound. (1)"
Point Lookout is not without its historic interest. It is thought that from its top Father James Marquette and his associate, Louis Joliet, on their voyage of discovery, in the year 1663, secured their first view of the great ''Father of Waters," which they had canoed down the Wisconsin to find. On the top of this point a picnic dinner was served. Many of the excursionists had brought with them their lunches. Others were served with sandwiches, cakes, apples and coffee and other eatables, a large quantity of which had been provided for the company through the generosity of Mr. and Mrs. Robert Glenn. Another treat which all present appreciated were the smoked Mississippi River sturgeon contributed to the dinner by members of the McGregor party. Never was a picnic dinner better enjoyed than that served to the hungry archaeologists and their friends on the top of Point Lookout. (1)"
"... the excursionists strolled back over the hillsides and through the beautiful valley to the steamer landing, whence all returned by boat to Prairie du Chien and to their homes. Thus closed very enjoyably and successfully the Society's state assembly at Prairie du Chien. 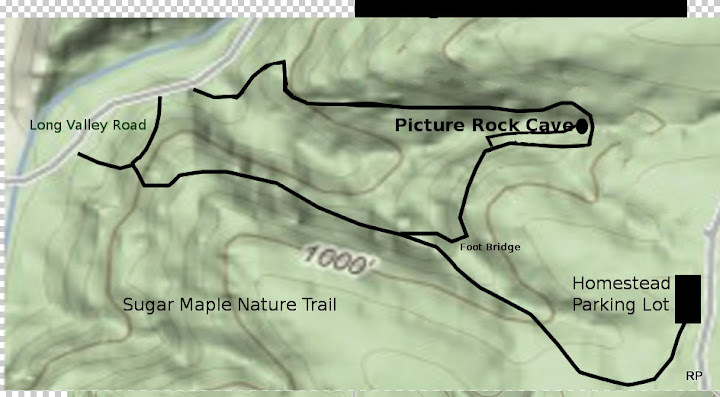 (1)"
Have you noticed a person's profile as you walked toward Treasure Cave? The profile, while always there, can be seen best when the leaves are off of the trees. Can you see the profile? The profile is on the right side of the bluff. 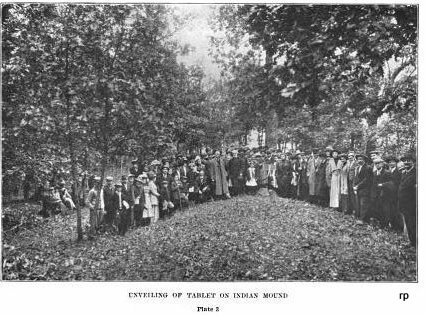 Quarterly Bulletin Published by the Wisconsin Archaeological Society.